Let's assume we lose left engine on a twin-engine aircraft during a straight and level flight without a side slip. In order to compensate yawing moment to the left from the right engine we deflect the rudder to the right (picture 12.21), however there appears an unbalanced force to the left behind the CG (rudder force). It is said (at least in the book I study about principles of flight) that there are two ways to balance the side force from the rudder: with wings level (picture 12.23) and by banking slightly towards the live engine. At first I would like to consider the first method. It states that yawing to the live engine gives a side slip force on the keel surfaces behind CG opposite to the rudder force. That's fine, however if it acts not through the CG (what is the case in the picture 12.23) there should as well appear a moment from that force which would again yaw the aircraft to the left? Am i missing something? Julious, Figure 12.21 is the one you should be looking at. Here the rudder yaw torque balances the asymmetric thrust torque, keeping the plane straight into the direction of flight. Minimizing drag is very important to maintain airspeed with an engine out. 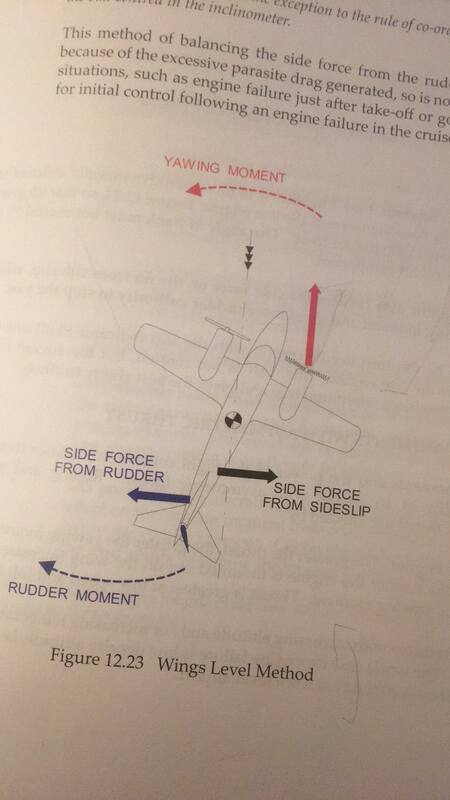 Figure 12.23 appears to represent a case where too much rudder as applied, creating a side slip. This is understandably confusing, but common sense will tell you the directional stability of the aircraft will try to bring it back into line with the direction of flight. That is what "side force from side slip" is. Remember, directional stability is there whether you have 0, 1, or 2 engines out! This is a part of the aerodynamic design of your plane so it flies straight, unless you use the ailerons, elevator, or rudder to tell it not to. It states that yawing to the live engine gives a side slip force on the keel surfaces behind CG opposite to the rudder force. That's fine, however if it acts not through the CG (what is the case in the picture 12.23) there should as well appear a moment from that force which would again yaw the aircraft to the left? I don't know whether the side force will create a left yawing moment or not. (The picture seems to suggest that it will.) 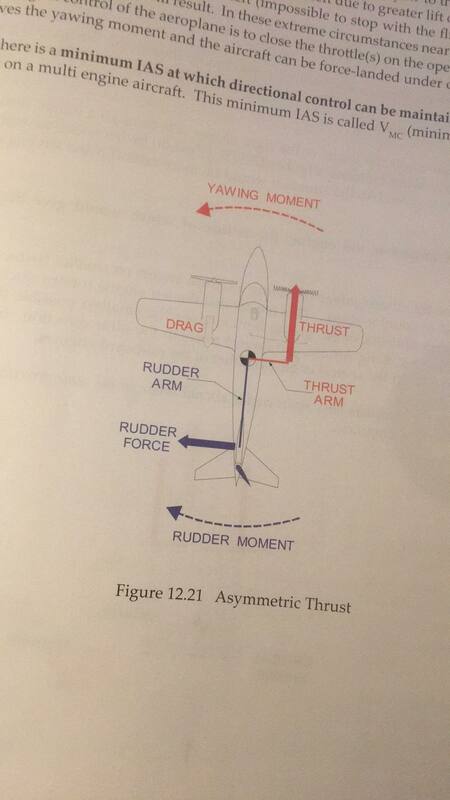 But in any case, if it does create left yawing moment, you can just add more right rudder to counteract it. There's going to be a point where the yawing moment from the rudder cancels out the yawing moment from everything else. Not the answer you're looking for? Browse other questions tagged engine or ask your own question. What is 2D and 3D thrust vectoring? How much thrust is available from the Allison T-56-A-15 engine? How to calculate the thrust of a piston or turboprop engine? How can a modified ramjet produce static thrust without a turbine? How does the reverse thrust work while landing? What forces act on cascade-type thrust reverser blocker doors? How does the nozzle diameter affect the thrust of a ducted propeller? Does bypass air produce thrust? How much thrust could a 400 mm EDF produce?